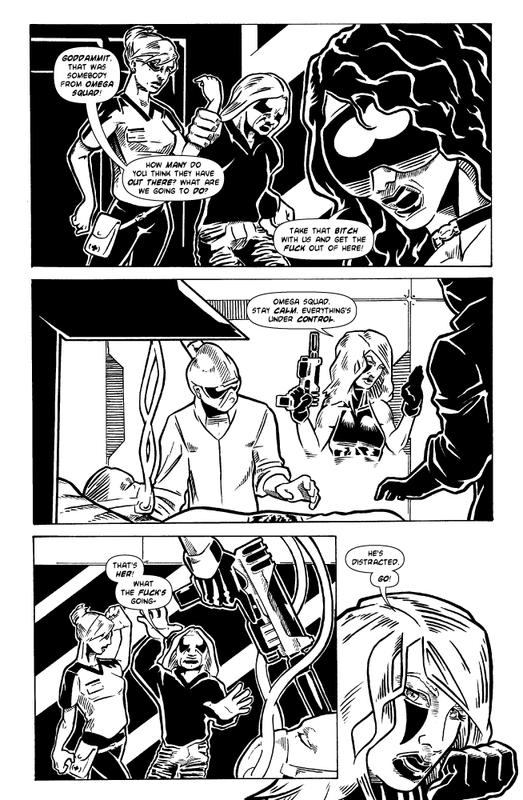 …and with this neat little cliffhanger (and a page that's a day late), I'm afraid I have to put Bulletproof on indefinite hold again. It's not what you think, though. Basically, the short version is that I may or may not have just landed myself a small amount of pro work that may or may not come with a deadline that may or may not interfere with my BP schedule. At the moment, I flat-out have no idea, but what with my horrible track record, I figured I'd give you the most cautious version. I don't know when the rest of this issue is going up, but I'll let you guys know here as soon as I can. Sorry if this is a bit vague, but this is the best I can do. If anyone else is actually reading this far in the coming weeks - yes, this chapter has an ending, and I really think I can actually get around to telling it this year. Bulletproof as a whole also has an ending, but odds are, I'll never get around to that. Anyway, some news maybe eventually. Thanks, man. Right now I really don't know. I'm so strapped for time, it's not even funny. Oof, has it been this long again already? Anyway, the pro work that I was sort of tiptoeing around when I posted this page is that I colored two pages of the current Bomb Queen issue, VII/4 out... last week, actually, on Image/Shadowline. You're all required to buy five copies. I'll be doing more fill-in work for colorist Paul Little this summer, although when any of it is going to get published is anyone's guess. That's good for me, but not good for Bulletproof. I need to work out a schedule here and see how I can squeeze in the 8 remaining pages for this issue. @cyberdog, glad to see you're still around too! @Lemniskate, yep, hat alles soweit geklappt, danke - nur heisst das, ich hab für's Erste wirklich keine Ahnung, wie's hier mit BP weitergehen soll. Ich hoff, es hat sich mit dem "pro work" geklärt und du hast den Auftrag. Heeeeey, this is still going that's cool.